Follow bestselling author, speaker, and pastor James MacDonald as he delivers the biblical hope of God’s promises in the midst of life’s storms. 2 Peter 1:3 refers to certain portions of God’s Word as exceedingly great and precious promises. Great promises are ones that don’t fall apart during difficult times; they reveal hope in the midst of the storm. Precious promises are ones that we find strong enough to hold us up and resilient enough to get us through. God’s promises become exceedingly great and precious to us when nothing else will do. By digging into the theology of God’s promises, Pastor James uncovers 5 major categories of promises in the Bible and the 5 areas God repeatedly makes promises concerning. From dealing with fear and doubt to God’s goodness, help, and victory, the Bible has much to say about God’s presence in our difficulty. 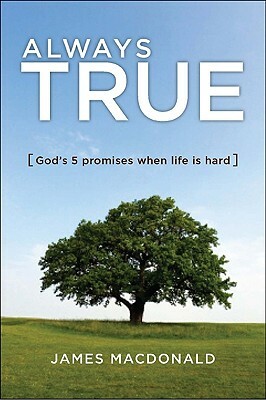 Always True will point you to God’s promises, which are just that: always true. JAMES MACDONALD is the founding and senior pastor of Harvest Bible Chapel in Rolling Meadows, Illinois. Pastor MacDonald has written many books, including Lord, Change My Attitude...Before It's Too Late and Gripped by the Greatness of God. Pastor MacDonald's teaching can be heard on Walk in the Word, a daily 30-minute radio program heard on outlets across North America. Pastor MacDonald and his wife, Kathy, have three children and reside in the northwest suburbs of Chicago.